He leaves to cherish his memory three beautiful daughters, Tyrah Burton, Iyana Burton, and Jena Wishart, his living legacy; his sister Toani Bowers and brothers Terrece Harris and Lemar Burton; his aunts Amelia Cusack, Harriet Cusack Bell, and Ethel Charlene Owens; uncles Anthony Cusack and Rhett Cusack; cousins Nekeisha Stacey, Yolanda Cusack, Charles Cusack, Tiffany James, Tarah James, and a host of nephews, nieces, cousins, aunts, uncles, in-laws and loving friends. To send flowers or a remembrance gift to the family of Christopher T. Burton, please visit our Tribute Store. 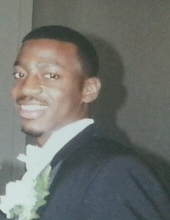 "Email Address" would like to share the life celebration of Christopher T. Burton. Click on the "link" to go to share a favorite memory or leave a condolence message for the family.